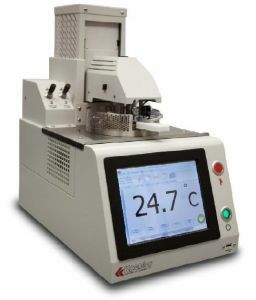 Product Description The Koehler K71000 Automatic Pensky-Martens Closed Cup Flash Point Analyzer is for flash point determination of biodiesel, distillate fuels, new lubricating oils, residual fuel oils, cutback residua, used lubricating oils, mixtures of petroleum liquids with solids, petroleum liquids that tend to form a surface film during testing. The Automated Pensky-Martens Flash Point Analyzer represents a perfect union of next-generation technology with traditional robust quality. The system software runs on an integrated processor PC running the latest Windows operating system. The 8.4" touch screen interface fully displays all operator parameters and results on a single screen. A three (3) position mechanical lift system for the cover and motor assembly is fully automated and software selectable: Open - Clean - Test for one touch positioning of the test cup. Comes standard with two flash detector systems including thermocouple and ionization ring detection. Over 65,000 results of data can be stored on the local hard drive. Integrated Dual Fan System directly cools the test cup and the environment around test cup. Unlimited number of user programs including a quick test that safely tests from ambient, puts the flash point result into the EFP of the official run, and prompts user to refresh the sample, virtually assuring no fires ever occur. In addition, the instrument comes standard with an inert gas fire suppression system. Safety: Fire prevention, detection, and suppression systems standard. The cup is constructed of brass.